NOTE: Please make sure you have confirmed your site in Pinterest. You will need to enter a special code in SEO->Social->Pinterest. Pinterest explains more about the code here. Pinterest must authorize your site for rich pins. Validate and apply for rich pins by following these steps. Enable Open Graph in our plugin. Enter a URL to a page or post that contains rich pin data. Choose 'HTML tags' and click 'Apply Now'. 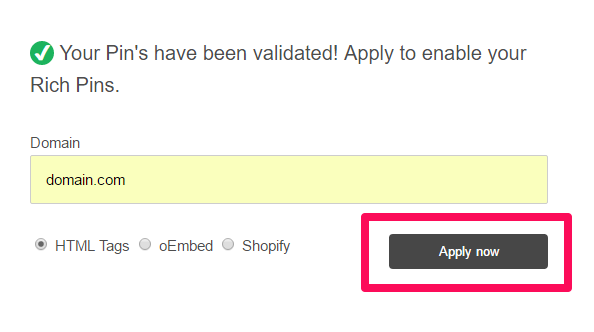 The validator will run and you will see a validation confirmation and apply now link. Verify the domain name is correct. Choose HTML and click “Apply Now”. You will see a confirmation that your application was processed. Pinterest will contact you after reviewing your site. Hint: If you scroll down, you will see a sample of the information available for rich pins. On your homepage Yoast will output the following OpenGraph tags: meta property="og:type" content="website". In order to make Pinterest validate rich pins for the homepage you will need to develop the ability to output "article" only on the homepage and place it, most likely, in your theme's functions.php file. You would need to use the Change Yoast SEO OpenGraph Type code here: Develop Filters to Set Custom OpenGraph Tags. Please know that you may need to develop the ability. Prior to any changes on your site we recommend making a backup of your site or performing the work first on a staging site. If you need to create a staging site or need to backup your site, we suggest speaking to your host provider for more information. Please also know, that any changes made to your theme may be overridden in the next theme update. It is highly suggested to use a Child Theme. If you are not sure how to use a Child Theme, please speak with your theme developer. Pinterest no longer supports price variations or ranges unless you are using a feed partner like Shopify. WooCommerce SEO supports several Pinterest Rich Pins as described in this guide.